Donkey Kong on your mobile? The series premiere of ABC's Resurrection went out on Sunday — in North America, at least — and the show's glaring similarity to the hit French TV series Les Revenants wasn't the only eye-opening thing about it. 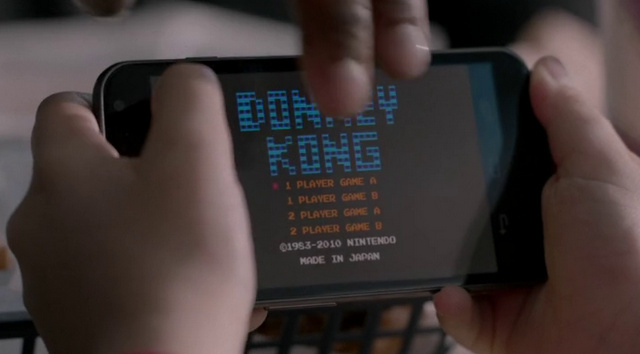 In one scene, a character is seen playing a game on his Samsung Galaxy Nexus smartphone which happens to be Nintendo's Donkey Kong — complete with on-screen virtual buttons for movement and jumping. Of course, no version of this game (officially) exists on mobile, which means the producers of the show either sourced a bootleg version, used emulation or simply mocked-up the screen. The latter is the most likely, which begs the question — does someone at ABC want Nintendo to bow to pressure and bring its catalogue of titles to iOS and Android? Would this count as subliminal messaging? Who the heck would wanna play Donkey Kong or any other NES game with one button, and the D-pad on the right-hand side? Hey, show producer! Put a 3DS on camera with the official game! It'll be PLAYABLE! @Damo @HopeNForever I always thought being able to flip the screen and so make the d-pad and buttons switch sides on the Lynx was a cool feature. Love the casual copyright violation and promotion of piracy here. Can't this create some legal trouble between Nintendo and them? I don't really understand this fascination with Nintendo games on smartphones. I don't think it would be the instant money maker clueless shareholders and internet trolls think it would be. Sony and Microsoft have put a few of their console franchises on smartphones like Halo and Ratchet And Clank, and haven't really set the world on fire. I'd love it if at the start of the next direct, Iwata bows, then says "No Nintendo games on smartphones", pulls a Galaxy S from his pocket, then smashes it into pieces with a hammer, followed by "please understand"
Nintendo just wants to make games for their own consoles, but I guess the world is too ignorant to understand. If they ever ported games to App Stores, people would just complain about controls. @Ichiban Someone needs to make this a gif. I really dont get the fascination with this,the timing NEEDED to play Donkey Kong properly is impossible on a touch screen and that also counts for nearly every Nintendo game going because there not single button mashing simplistic crap that most popular mobile games are. 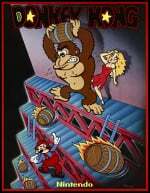 The 1983-2010 copyright info means it's the tweaked "Donkey Kong – Original Edition" NES ROM released as a Club Nintendo reward. @Emblem Well, it seems to be ok as long as you use smart devices. You can promote this kinda stuff in the shop, you can openly talk about it, you can show it on TV...its sickening. They used the 2010 ROM released with the european red Wiis that include the lost level from the arcade version! @Raylax So you are left handed? Interesting, cause I have often ponderd if it makes any difference what side controllers are. Is it your understanding that it does not matter much. After all we do not use our most flexible and fast fingers to push buttons, we use the big slow ol' thumb to do the precission work. They should have just used the Arcade version. (Something that made Nintendo re-release it properly would be good). Should have been playing donkey kong country returns 3d on a 3ds. Would seem more legit. Are people seriously complaining that a show about dead people returning to earth 30 years later is promoting piracy? This isn't exactly Cosmos. Or even Honey Boo Boo. It's kind of, you know, fiction. I don't get on why idiots like them think its a good idea to bring Nintendo games on mobile devices? That's like Sony giving Microsoft "The Last Of Us". Seriously this needs to stop. Why doesn't ABC worry on how can they make better shows? I forgot about this show. I was going to watch it but I ended up watching the "resurrection" (pun intented) of Carl Sagan's Cosmos which premiered the same night. This lefty wouldn't be able to play with the D pad on the right like that . And I don't think Nintendo games on smart devices is a good idea. @unrandomsam unfortunately there are weird issues there...Nintendo apparently doesn't own the code for the arcade version. If I were Nintendo, I'd sue their donkey. Ok, the amount of uncoolness in this is really sad. Nintendo does NOT belong on mobile. Unless they come up with a new IP that works with a touch screen (which they COULD do no problem). ugh, what a terrible idea, DK would be impossible to play well with virtual buttons. I'm sure it's entirely a mockup, though why not just have the character playing DK on a 3DS legitimately? My lord people... WAY too much over analysis going on here. Obviously someone on the creative staff just wanted to throw a shout out to classic gaming and make the character a little more "current" by putting it on a mobile device as opposed to a handheld. No big deal. I watched this episode and thought it was a really cool nod, shoddy control scheme and all. They are in the business of making TV, not designing UI. The nod was cool enough. I've also been thinking a lot about Nintendo properties on mobile devices. I had been a very strong opponent to playing classic games on mobile devices because of the lack of control. Until I found these: www.phantomgp.com. they actually work very well! But aside from that, who says Nintendo has to bring their franchises to mobile in the form of action or platform games? There are tons of quality games on mobile like puzzle, puzzle/rpg, physics based games etc that would be greatly enhanced with Nintendo's IP and the love and care they put into building quality gaming experiences! I would love to see some Dr. Mario, or Yoshi or Mario & Luigi puzzle/RPG games. Or how about Pikmin? With an all-touch control scheme and the care and quality Nintendo are known for, I could totally see buying these games made with mobile platforms strengths in mind as opposed to fitting a square peg in a round hole. And why use a Galaxy Nexus? That phone's ancient by today's standards. Uh, why is everyone jumping to conclusions? This might be a subtle hint towards Nintendo supposedly being better off supporting mobile devices, but it could also be a combination of two controversial pop culture phenomenon (back then, arcades were controversial, yes) - arcade games and smart devices. @OorWullie Advance Wars doesn't require precise timing for inputs, so it stands to reason that it works. For active controls like in Donkey Kong, this doesn't hold true at all. @9th_Sage It is in Donkey Kong 64. Some combination of the NES original edition / Arcade Sprites might be acceptable if it is the only way. LOL this bothered me too while I was watching it. The entire time the kid was playing it I was like "...but... that's an emulator... it's illegal... wtf...." Too much time spent on NL I guess. I chose to just see it as a nod to the old Ninty magic. I seen it. One thing that came to my mind was the child woke up something like 30 years later. So it would be a game he recognized not a newer one. I'm not sure on the exact year he resurrected, but kept thinking is that even legal. Okay, now we're getting a little ridiculous on what's considered "Nintendo news." If it's a slow news day, I understand, but please stop posting stuff that has tenuous links to the company. i prefer full fledged nintendo games on nintendo consoles, that includes retro games. mini games are ok for smartphones. When will they ever give up? Nintendo ain't releasing nothing on mobile, just make clone games if you want it that much. Mario, Zelda, Metroid, Kirby, Donkey Kong, F-Zero, Star Fox, Pikmin, Punch-Out!, Golden Sun, Fire Emblem, EarthBound, Baten Kaitos, Xenoblade, Pokemon, Starfy, and all of Nintendo's main franchise will never come to mobile, not now, not ever. I'll just say it right now, if Nintendo is ever forced into going this route, I hope the industry burns. I'm really sick of hearing about this with the 3DS doing as well as it is also. These f'ing investors. So sick of these stupid asses, who don't know sh*t about the industry. Just go away.